Power Machinery Australia introduces the MEP Shark 282 NC EVO, a new range of CNC-controlled, electro-hydraulic automatic band saws that are among the most versatile of metal cutting saws. 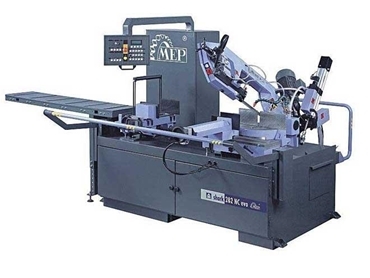 In addition to automatic mode, Shark 282 band saws can operate in semi-automatic, semi-automatic/dynamic and manual cycles (for cuts from 45º right to 60º left). The manual or semi-automatic/dynamic cutting cycles are free of any parameters, allowing easy use for odd cuts. According to Ken Christensen, Power Machinery's Managing Director, the MEP Shark 282NC EVO not only gives the operator the ability to program multiple lengths on a single piece of material and cut automatically but also still functions as an excellent mitering semi-automatic saw for all the one-off jobs that come into most shops.